Before they were incorporated they were in college. The long-awaited prequel to Monsters Inc hits theaters today. Monsters Inc. was so beloved Monsters University has pretty big scary shoes to fill. 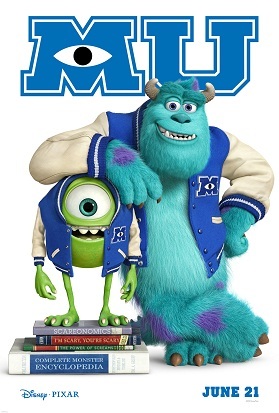 Rather than go the sequel route Monsters University is a prequel to the first movie. Monsters U takes you back to the college days of Mike Wazowsky and James Sullivan long before they were buds and saved Monstropolis. I always love a prequel it’s fun to see how all the pieces fit together. In addition to the collegial Wazowzky & Sullivan we also get to glimpse the early years of evil Scarer Randall Boggs when he was a young nerdy college student. Roz, a fan favorite from the first film makes a cameo and is sure to let the duo know she is watching them always watching. 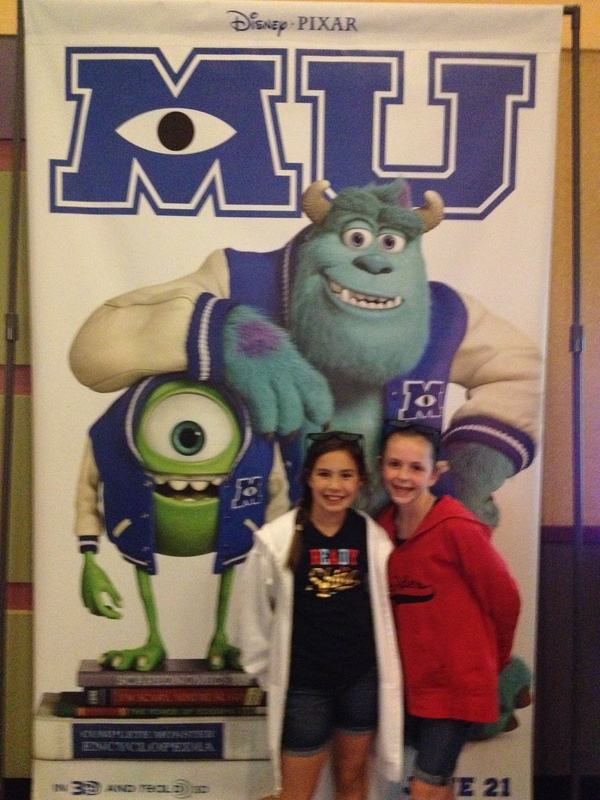 In Monsters University Mike and Sully are not fast friends. In fact they are more like enemies. Wazowsky is a conscientious student who has worked hard to get to Monsters University and is determined to be the top scarer in the elite scare program. On the other hand Sully sees little value in studying and instead just wants to have a good time and trade in on his famous family name. As the pairs animosity grows it gets of control and they end up getting thrown out of the scarer program. Now they must work together with a bunch of monster misfits to get back in the good graces of scary college dean Hardscabble. 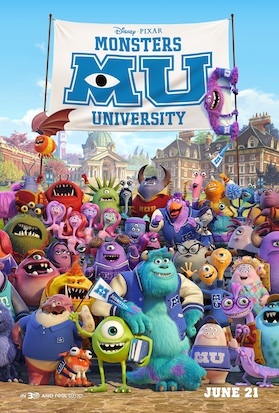 Monsters University is very reminiscent of other college films you have seen like “Old School” & “Revenge of the Nerds” It is full of college pranks, fraternities, sororities, and a rag-tag team of misfits who need to work together to overcome adversity. We all give this film a big thumbs up it is such a great film for all ages. Amelia was a little scared of Dean Hardscrabble but loved it nonetheless. Although, nothing can be as good as the original this movie comes pretty close. This entry was posted in Disney, Entertainment, Family Movies and tagged Film, Helen Mirren, Monster, Monster University, Monsters Inc, Old School, Pixar, Revenge of the Nerds, Sully, Wazowsky. Bookmark the permalink.